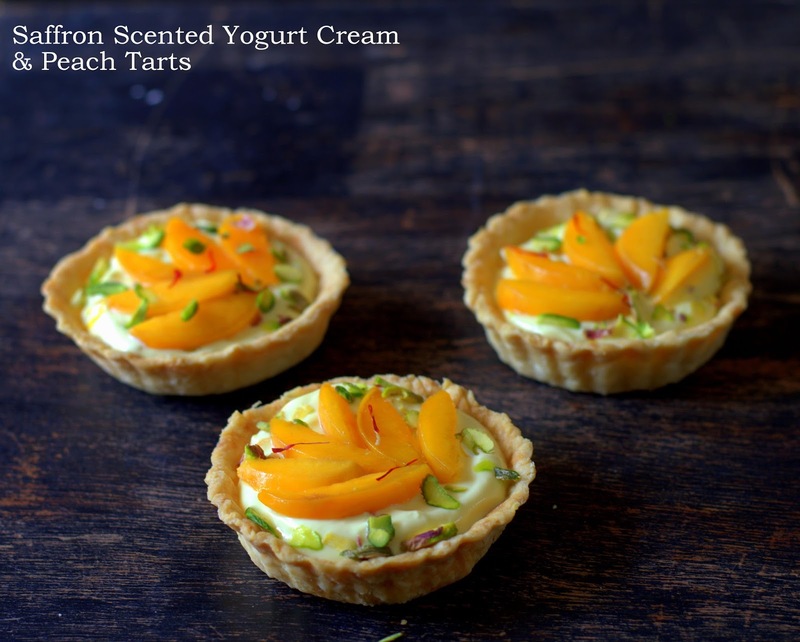 Saffron Scented Yogurt Cream & Peach Tarts. Dairy products, fruit and vegetables are things I love to splurge on! I would rather have an excess of these in my refrigerator, than wait to cook or plan cooking after a hurried trip to the store. The milk is boiled and refrigerated the previous day, a few tetra-packs of them stashed away for emergencies. Lassi and buttermilk in tetra packs come in handy always. And how can we not have paneer , and no we don't ever get tired or bored of it ubiquitous though it undoubtedly is! I mostly make it at home with 3% milk, though I prefer the firmer packaged variety for grilling. We eat yogurt like there is no tomorrow and I set it every night. Its an integral part of our breakfast, lunch , dinner and snacks. Chilled low fat yogurt sweetened with a bit of sugar and vanilla, topped with nuts is often my guilty pleasure post lunch! Blitzed with fruit it's a refreshing drink in the kids' snack box. The hunger pangs born out of boredom can often be remedied with some yogurt sprinkled with chat masala! Sounds very dramatic, but yes, not a day goes without yogurt! 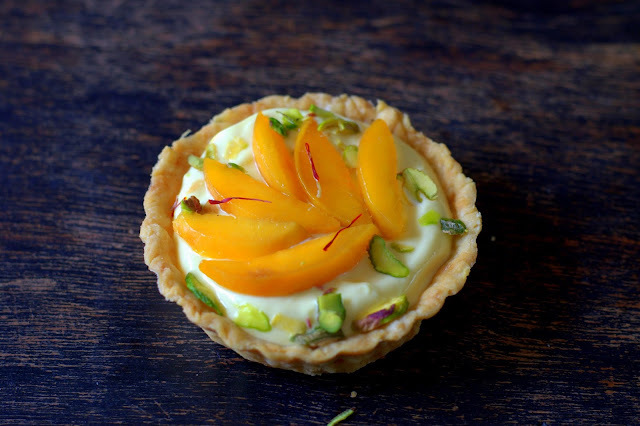 I made these little tarts filled with saffron scented yogurt cream, pistachios and peaches. Hung curd, sweetened, whisked with some saffron infused cream can't be anything but good of course! A bit of texture with chopped pistachios makes it even better. Light and delicious, a simple, make ahead recipe for Mother Dairy's Summer Of Happiness Challenge. To participate, submit a recipe using any of these Mother Dairy products. 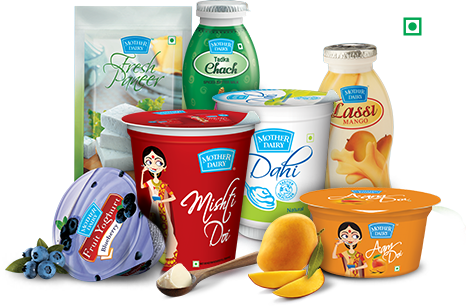 Mother Dairy Paneer, Chach, Curd, Blueberry Yogurt, Mango Lassi, Aam Doi and Mishti Doi. More details and recipes by Chef Vikas Khanna here. Delicately flavored yogurt cream and peaches in crisp buttery tart shells. Mother Dairy Curd - Two 400 gram boxes to give about 1 1/2 cups hung yogurt. Pie weights or kidney beans. Small squares of aluminum foil. Whisk together the flour, sugar and salt, transfer mixture onto your kitchen counter. Flatten, wrap well in cling film and refrigerate for at least half an hour. Overnight is fine too. Gently roll out the pastry about 3-4 mm thick. Cut out circles . Slip them in gently into the tart molds, taking care not to stretch it or it will shrink later. (If I ever learn to do this neatly, will tell you how) Cover with clingfilm and refrigerate for an hour or overnight to suit your schedule. Place on a parchment lined baking sheet, cover with cling film and refrigerate. Pre-heat oven to 190 C/ 375 F. Remove cling film, place squares of foil inside the cups, put some kidney beans to weigh them down and bake for 18-20 minutes or till light golden and crisp. Store airtight till needed. Drain the yogurt in a muslin lined sieve, placing a large bowl underneath to catch the whey. Place in the refrigerator for about 8-10 hours to get very thick yogurt. Warm the cream with the saffron very gently over low heat. Refrigerate. Whisk together 1 cup of the hung yogurt, sugar and 1/2 cup cream till light. (vary proportion to taste) Stir in the pistachios. Keep refrigerated till serving time. Just before serving, spoon the yogurt cream into the tart shells, top with the fruit slices and more pistachios. Serve immediately.